Book Bite Reviews: In My Mailbox (IMM) FIRST EVER!! In My Mailbox (IMM) FIRST EVER!! 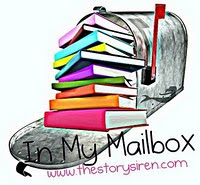 "In My Mailbox" is a weekly feature hosted by The Story Siren that showcases what you have bought, received, won, and borrowed through out the week. Thanks for checking out my first IMM. What did you get? Looks like you got some wonderful books,(especially Hex Hall and fall for anything, i have heard wonderful things about those titles) hope you enjoy reading them and i look forward to hearing your thoughts. And im checking out your blog right now =] Have a great week! !